The Willamette River is our home. We live on or near its banks and cross it every day. Yet, for generations we humans have mistreated, neglected, and scorned it. Well, the tide is turning. Together with others, the Human Access Project (HAP) is helping people "get into" this natural treasure - to enjoy it, preserve it, and cherish it for generations to come. VISION A city in love with its river. MISSION Transform Portland’s relationship with the Willamette River. Use it: inspire Portlanders and visitors to connect with the Willamette River. Let’s face it, even if you wanted to swim in the Willamette River in downtown Portland, how would you do it? There's no easy way to get into the water. Frankly, that’s crazy. Here we have a natural treasure running through the heart of our city and no easy way to enjoy it. It’s like this: if you want birds to come into your yard, you put up a bird feeder and plant trees to create a bird-friendly habitat. The same is true for humans and the river. If we want to make it easy for people to swim and recreate in the Willamette we need to create better access and a more inviting environment. That is the path we are on. Follow us! The following is an excerpt from, “PORTLAND A Historical Sketch and Guide” by Terence O’Donnell and Thomas Vaughan. “In the 1920s, the river through downtown was lost. From the beginning, the city’s water playground had also been the city’s sewer. Boat clubs declined the use of the river as did swimmers, lovers, fishermen and boys in skiffs. Also, now the river steamers stopped plying to wharf towns, their wakes no longer fanning the surface, their place taken by other forms of transportation. 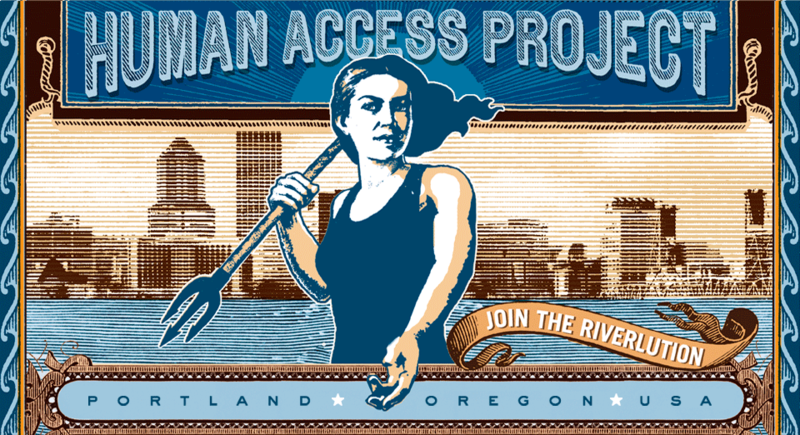 The Human Access Project is part of the movement to reclaim the Willamette River - to improve access to it, restore its health, and preserve it as a natural resource for generations to come.